I have been waiting months to share these gorgeous bridal portraits of Catie. 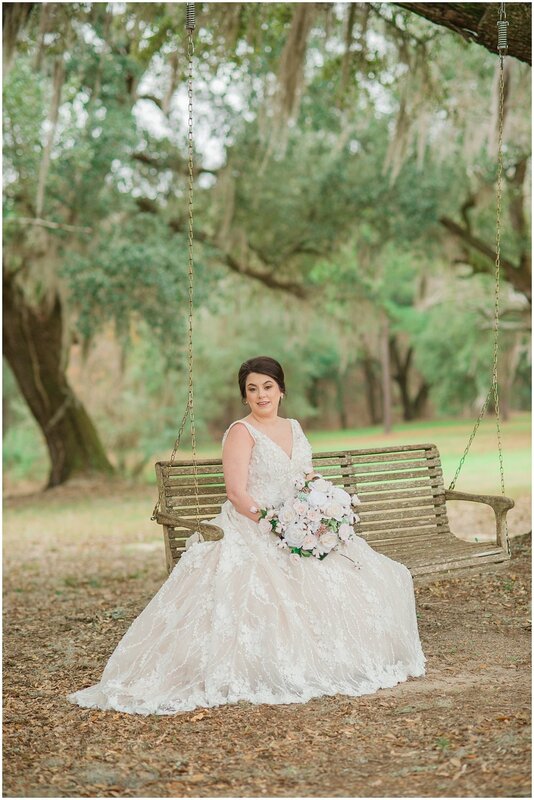 We took to the beautiful scenery at San Souci Farms in Sumter, South Carolina, to capture these stunning images of Catie all dolled up. She had the most supportive group with her; including her mother, sister, two aunts, grandma and grandpa! She is surely loved by everyone around her, that’s for certain. This particular day was probably one of the coldest days we could have chosen to photograph her bridal portraits; but we made it work and I think the entire session went better than we could have planned. I absolutely loved the gown Catie chose. I honestly don’t feel like these photos do it any justice, it is MUCH more gorgeous in person, with its stunning lace detail. She paired it with a cathedral veil that pulled the look together perfectly. San Souci lent the perfect location with its moss covered oaks, and the most beautiful, tree laden, rolling hills. Altogether, we were able to achieve capturing Catie’s stunning beauty. Check out her session below of a few of my favorites.